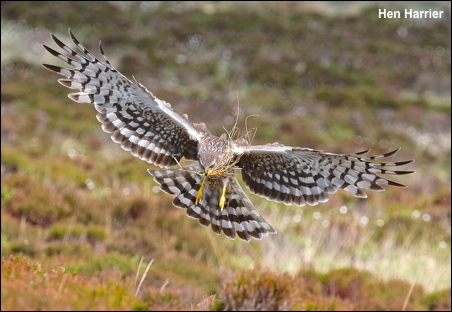 This weeks blog photo is of a female Hen Harrier returning to her nest with nesting material and is my favourite photo from my work this year and coincides with today’s National Hen Harrier day. I attended the Bowland meeting which re-iterated the appalling fact that only one pair of Hen Harriers this year nested on an English Grouse moor and reared just one young. Conservative estimates state that there should be at least 300 pairs nesting in England. The reason for the shortfall is that they have all been shot by gamekeepers to increase the number of Red Grouse available to be shot by the landowners clients who can pay as much as £5000 per gun for a days shooting. DEFRA and ENGLISH NATURE have chosen to ignore this persecution and Mark Avery has started a National Petition to ban driven Grouse moors in an attempt to stop the persecution of Hen Harriers.